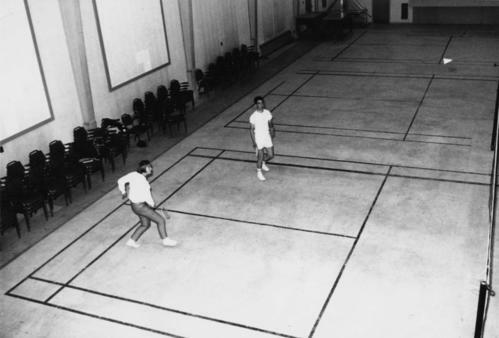 Photograph depicts two men with badminton rackets in foreground of gymnasium, net visible on far right. Doors, tables, and chairs visible in background. Item is part of the Cassiar Asbestos Corporation Ltd. fonds. Image is one of 45, see items 2000.1.1.3.19.33 - 2000.1.1.3.19.77. See also items 2000.1.1.3.19.54 - 2000.1.1.3.19.58 for images featuring similar content.